When I first thought there were chocolate covered wine gums, I was excited, then confused. I wondered how that would work but it didn’t matter. Chocolate covered Oreos I was also excited about but again I was wondering how it would work. The Oreos were tiny but that didn’t matter – I wanted chocolate. The Maynards actually was a bag of wine gums and chocolate buttons (including caramel ones) and some chocolate covered fudge bits. 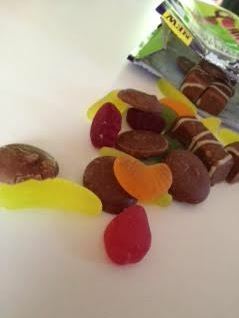 I do love wine gums and to be able to buy a bag which has a few wine gums, some chocolate and some fudge meant that I could have something different depending on my mood. It’s colourful fin and for kids, perfect for fussy eaters – they can choose whatever they want. I’ll take the purple ones. 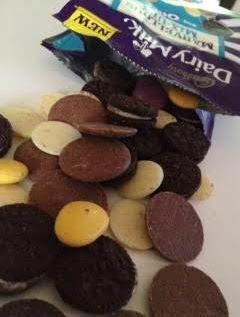 The Oreo ones had Pebbles in them which I love as well as little baby Oreos and white chocolate buttons alongside the traditional buttons. What a fantastic grouping of things. There are white chocolate buttons in this bag, something not really easily accessible elsewhere on the market. While I might not buy a bag for the white chocolate alone, it is certainly a nice addition and one I know a few friends will like. Overall both the bags are a bit of fun and might be nice to pick up on the supermarket shelf if you’re looking for something a bit different.